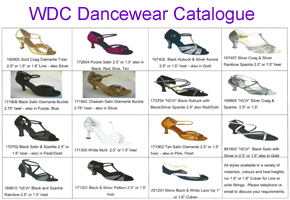 WDC Dancewear is a supplier of quality, comfortable and stylish dance shoes at an affordable price to customers nationwide. As dance teachers ourselves with over 30 years’ experience, we understand the importance of well manufactured dance shoes. We are always willing to give advice on the correct shoe for you, so please feel free to contact us. We are always introducing new styles to keep up to date with the latest fashion. Custom Made Orders on request. Please allow 4-6 weeks for delivery.